Stephen Sondheim and James Lapine’s well-loved musical Into The Woods sees a Baker and his Wife commanded by their witchy next door neighbour head off into the titular woods to find 4 ingredients which will help them to break an infertility spell and allow them to have a child. 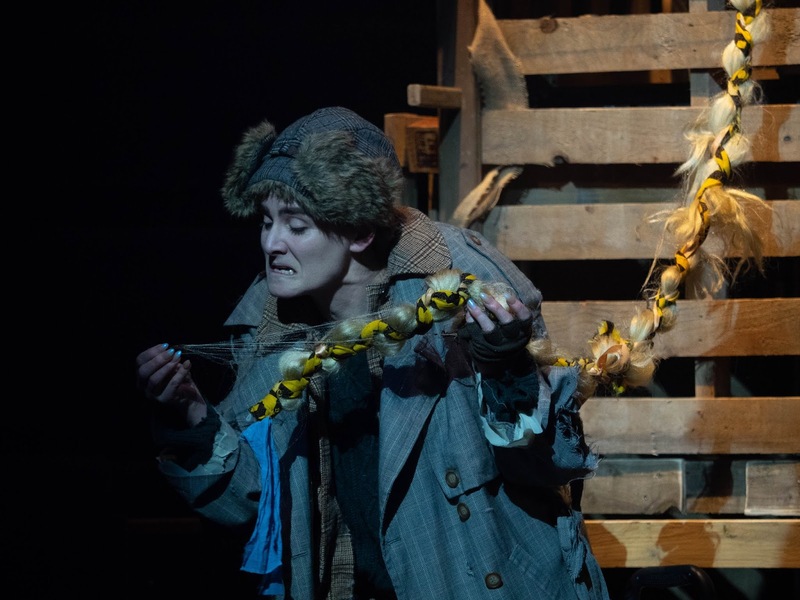 On their journey they run into famous storybook staples like Little Red Ridinghood, Cinderella and even the evil Wolf, but no one is quite as two dimensional as they seem on the page, as Into The Woods explores what happens after “happily ever after”. ﻿﻿Located in a fairy tale world melded with our own, where the Princes waltz around in pastel coloured blazers and boat shoes (classic Made in Chelsea fair), the evil stepsisters are wannabe TOWIE stars, and the Baker and his Wife slave away behind the counter at Greggs, Tim McArthur’s reinvented production of Into The Woods locates its focus not only on family but also the state of society, as it draws attention to the contrasts between the wealthy Princes and Cinderella’s nouveau riche stepmother, and the working class underlings who suffer as a result of their actions. Most inventively, Jack (of beanstalk climbing fame) and his cider chugging, thong flashing mother are loud mouthed Glaswegians who stick out like sore thumbs, clearly judged negatively by those around them due to their implied poverty. The production is staged in the round, allowing for the stage area to stretch outwards as well as upwards (rickety wooden ladders hang down from the sky, implying the giant kingdom above) and making plenty of room for the vast and sprawling story which drives the musical. Sadly, although Joana Dias’s set is inventively designed, it does often create sightline obstruction issues, and coupled with the Cockpit Theatre’s iffy sound system, some lines are lost and significant moments blocked from view. Cutting through the unreliable acoustics, Michele Moran is a revelation as the Witch. As creepy as the crone who sends the Baker and his Wife off on their journey as she is statuesque and poised as the almost ethereal post-curse enchantress, Moran thrills with glimmering vocals and an immutable presence. Louise Olley is similarly spectacular as Rapunzel, her crystalline soprano ringing out around the space, she is wonderfully sweet, and sporting a long rope of blonde hair, she is a typical storybook Princess in the making, which only makes her inevitable act 2 downfall all the more upsetting. Florence Odumosu is also an enjoyable presence as Little Red Ridinghood, whilst Jo Wickham is hilarious as the motherly Baker’s Wife, lured from her safe story by the temptation of an exciting forest tryst with a womanizing member of the royal family. Despite the multitude of characters populating the musical, each exploring their own storyline, the production does suffer from a bit of fatigue in act two. The story moves quickly, but the songs are staged a little too leisurely and incidentally, making some of the less eventful tunes stop the plot in its tracks. The dramatic deaths which come thick and fast post-interval also have relatively little impact on the characters, thus lessening the emotional impact of the denouement. When the story comes to a head and Abigail Carter-Simpson as Cinderella leads the surviving characters in a rousing rendition of No One Is Alone, the song is undeniably impactful, but doesn’t quite reach tear-jerking emotional heights. Nevertheless, Tim McArthur’s production of Into The Woods is a creatively staged and hits almost all the right notes. 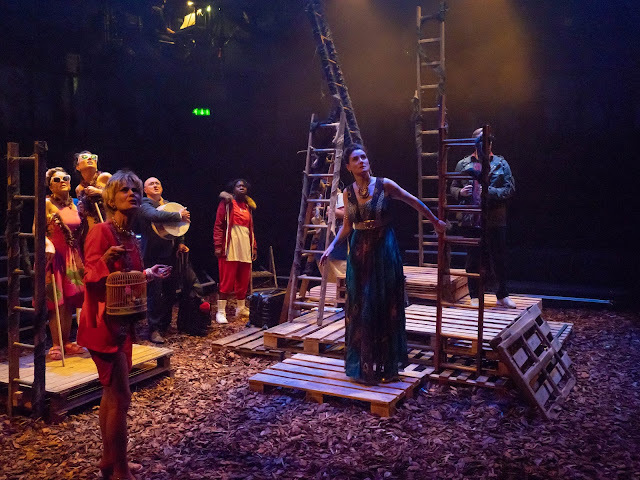 With a talented ensemble cast, and imaginative design, it makes the most of the petite Cockpit Theatre stage, and brings plenty of charm, as well as darkness, to the magical musical.